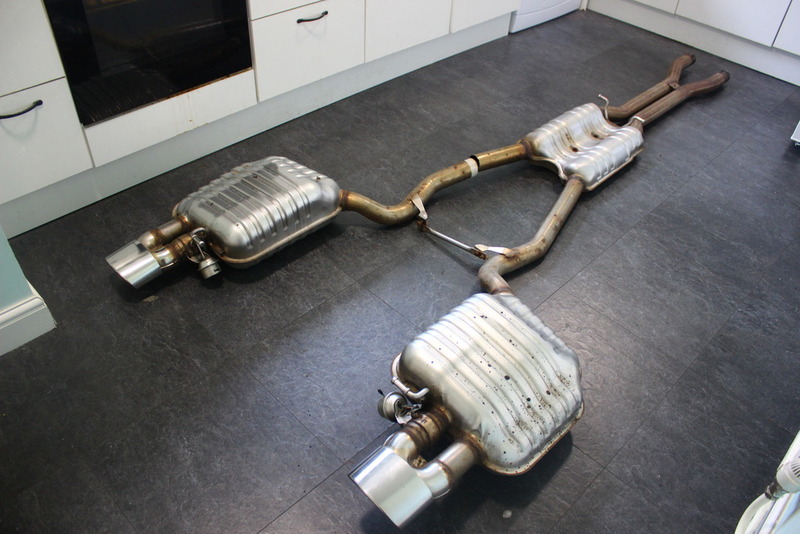 B7 RS4 rear silencer size compared to A4 tfsi silencers. As in the tilte really chaps. Toying with multiple exhaust upgrade options at the moment and rear silencer /tail pipe fitments is on my mind. Does anyone know how much bigger B7 rs4 back boxes are compared to A4 2.0tfsi boxes , quite like the idea of fitting a pair of rs4 boxes in my S4 valance , well if the boxes will fit that is, I know the valance is deeper on the rs4 but curious as to wether the boxes will retro fit complete with oval outlets. I can measure the ovals on mine if that's of any help? Won't be able to get underneath tho. Could just weld oval tips on if they line up. yep , oval dimesions would be a great starting point. I have a feeling the back boxes are bigger though, well taller but not sure how to find out those dimension as yet, but great if you could measure your oval tips. many thanks mike, that's a great starting point. I have a chance at a rs4 full system but maybe just using the back boxes if they fit, looks like tips will be fine. You haven't seen the rest of the car!! Needs a proper good wash.
Might be an idea to contact a seller on ebay who's got RS4 boxes listed. See if they'll measure them for you? Yep, on the case now . Just found some comparison pics , rs4 are most certainly wider to start with so probably wont fit under narrow A4 bodywork / boot area. maybe S4 back boxes , that said I was sure the S4 and rs4 used almost the same box sizes , if so that throws out wider fitment on the rs4 as the s4 has the same chassis boot as A4. To be fair Rob the extra width on the Rs4 is in the quarter panel, the area the silencer fits in is the same as its governed by a wall that drops down at the side of the chassis leg which is the same on both cars. I think your problem may possibly be the height of the tailpipe if the rear bumper is deeper but this could be overcome by adjusting the hangers. On a personal note I much prefer the quad pipe look to ovals btw. Also dont forget the rs4 back boxs are valved operated with a vacuum feed. Just something to consider. Really don't like any Audi's stock back box design, only way it could be half decent is by cutting it open and welding a straight pipe in then putting some form of dampening material to reduce noise around the pipe like some members on this forum have done in the past otherwise it baffles me how exhaust gasses even manage to get out the back of our car's with the mad stock Audi design anything with a turbo really wants the exhaust to be as straight as possible to perform. I have a few options in mind at present, the rs4 route as I was hoping to use the back boxes with tailpipes but if its a task i'll skip it, possibly new back boxes with some nice ovals tips or quad tips which i'm swaying towards but its the tip size that need to be right. Don't fancy it looking like a space shuttle at the back . I have seen a few sets but some nice stainless quads as they are 76mm each pipe with a staggered outlet not over kill diameter wise either. These are on the short list . 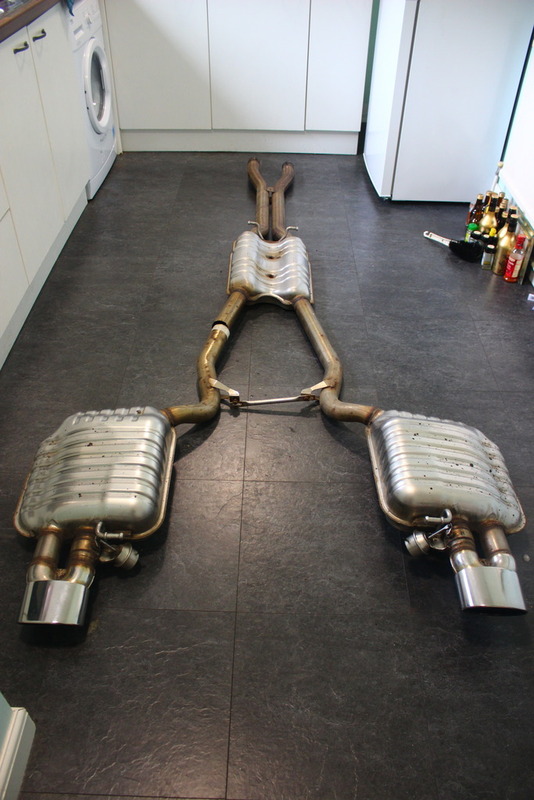 Any exhaust place will have tips like that and do what you want... why people buy stock exhausts baffles me. That's interesting, I wouldn't have thought they would change that much, Maybe a different boot floor. What way don't they fit? Well, just had some measurements and been under the old bus and I cant see why they wont fit, looks like enough room from my measuring. 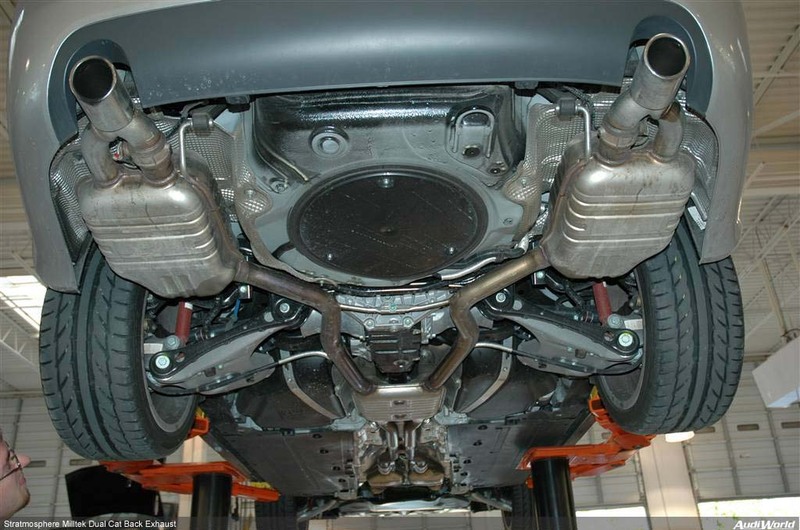 If the S4 back boxes fit into the same apature as the the tfsi , it is the same chassis after all then no reason why the rs4 boxes wont fit as they cant be any bigger , hey they are both V8 systems. just been looking at the parts schematics for a 2006 rs4 avant and 2006 A4 2.0tfsi avant , so far all the floor parts and side parts are the same , only the wheel arches and fitting are different , i'll dig a bit deeper to see what else comes up. so far the only part that is different is the spare wheel section and I don't think that is really crucial to the back boxes , I think I may just take a gamble and go with the rs4 boxes, nothing seems to ping up on the parts database that says that there is a major difference in floor section or side sections. Boot floor is unique to the B7 RS4. I cut the trunk floor out of a 2007 B7 RS4, which will replace my existing pan, so the exhaust will fit without clearance issues. It will not come close to fitting otherwise. RS4 boot floor is totally different from a regular B7’s I’ve been under both, and they might as well belong to different VAG models. Those rear mufflers ain’t called “suitcase mufflers” for nothing. They are insanely HUGE. I think its worth a go, just been under the back with a measure , they are the same length as mine, only a few cm taller, and wider , there is plenty of space around mine to allow for bigger units. depending on where the width falls, on the bumper void side or spare wheel recess. length is not an issue nor is the height, so only width to deal with, well depending on which way the extra width is placed. its not costing much so worth a go …..
what floor section are you referring to , I cant see any diffence in part numbers , maybe you can clarify which section is different so I can cross ref it. If you’re looking on ETKA / ETOS, the information there is misleading. The trunk floor pans are different part numbers. The RS4 centre section of the trunk floor would house the spare wheel in a regular B7. In the RS4, the spare wheel section houses the battery, even if you placed the battery elsewhere, the recess won’t hold even a space saver spare. The side sections are raised much higher to accommodate the suitcase mufflers. 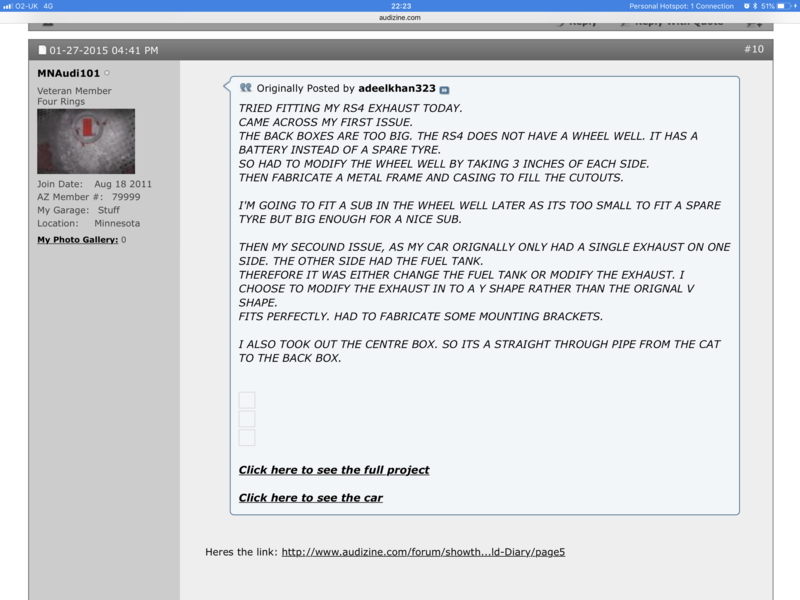 There’s a guy on Audizine, from Blackburn UK, who did a B6 Sedan to B7 RS4 conversion. 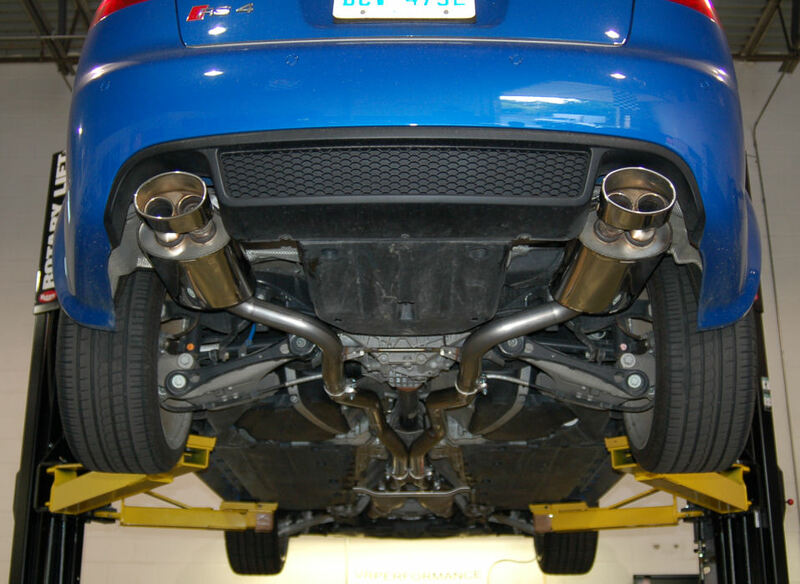 To fit the OEM B7 RS4 rear mufflers, he had to cut out the side sections of the trunk floor, and the cuts encroached into the spare wheel well, as the RS4 mufflers are not only deeper, they are wider. Believe me, they are diffferent floors. I have had both B7 RS4 and B7 A4 Quattro on vehicle lifts, and the trunk floors ARE different. which floor section on this rs4 part diagram are you referring to chap. A4 quattro: 8E0 802 088 AC. RS4 Avant: 8E0 802 088 AA. from what I can see the only difference between the two panels can be in the diameter of the wheel recess, all the other sections are the same. So looks like the part's diagram is a tad misleading, I new it was only for guidance from a viewing point of view but not really helpful when comparing parts. Is still worth a go, maybe just for the hell of it. I see the problem , its not so much size but where the increase in size is located, in the pic below you can see where the width factor of the rs4 boxes comes into play. 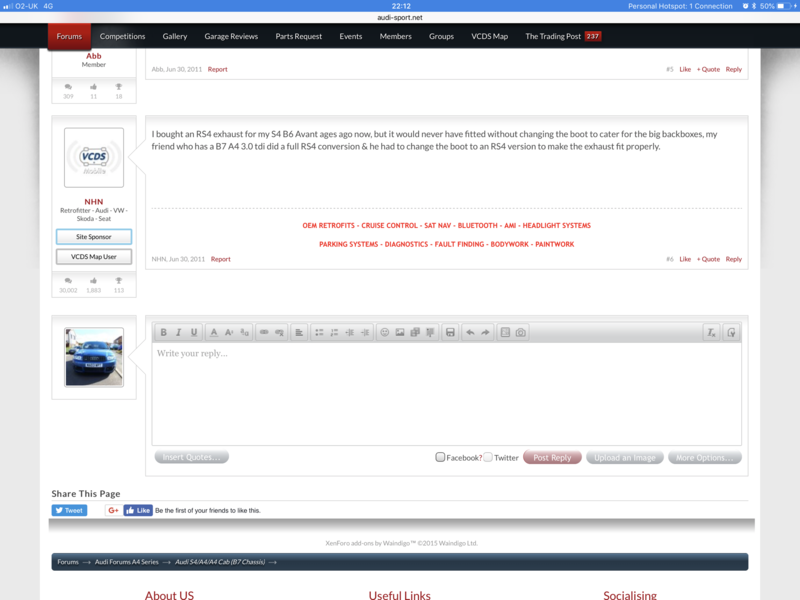 Still worth a go, maybe not …..maybe I should just go custom after all. I now see the difference chap, things are allways clearer in a photo. this option maybe better if I stick on an oval theme.